Lemonade. Is there a more refreshing summer time drink? Tart, slightly sweet, and bursting with lemon flavor. It is the best on a hot summer day. Did you ever have a lemonade stand growing up? I did. When I was seven or eight years old and living in Dallas, my best friend Rachel and her sister Hannah (who lived only two houses down) would come over and play with my brother and I nearly every day in the summer. We would build forts, ride bikes around the block, swim, and choreograph dance routines. One day we decided to sell lemonade in hopes of making "lots of money". We convinced my mom to get us powdered lemonade starter and plastic cups. The four of us set up a table outside of my house with a sign that read "The Best Lemonade, 50 cents". Or maybe it said, "Thirsty? 50 cent Lemonade Here." Something like that. We stood out there, in the middle of the day in a Texas summer, for hours. I think maybe 1 or 2 cars drove by. No one stopped for lemonade. The ice was melted, the lemonade lukewarm, and we were getting sunburned. As we were giving up, all of a sudden the cute high school brothers from across the street opened their door, and, with a bunch of their friends, saw us. I think they felt pretty bad for us, and walked towards us and each bought a cup of lukewarm lemonade. They gave us a ten dollar bill and told us to keep the change. They also said it was the best lemonade they had tasted. I was totally embarrassed and mortified but my brother was just happy we had customers and made money. We decided to close up the lemonade stand after our sale, and after splitting up the money we made, we each received a little over $2. I don't remember ever setting up the lemonade stand again. While I don't plan on selling my lemonade any time soon, I do love making it at home and sharing with friends. This brown sugar lemonade is a refreshing twist on regular lemonade, and is perfect to sip poolside on a hot day. It is also perfect to pair with whatever you are grilling for Dad on Father's Day tomorrow - Happy Father's Day to all the dad's this weekend! Combine brown sugar and 3/4 cup water in a saucepan. Heat over medium high heat for a few minutes, stirring, until sugar is dissolved. Set aside to cool. Pour brown sugar simple syrup into a pitcher and add lemon juice and 3 cups cold water. Stir. Serve over ice with fresh mint or lemon slices. The weather has been absolutely gorgeous here in Texas the past couple of weeks. I have been spending as much time as possible outdoors, including going for runs outside and sitting on our backyard deck in the evenings instead of on the couch in front of the TV. I try to enjoy it now because once the summer heatwave comes, you will most likely find me inside with full blast A/C or in my swimsuit in the nearest body of water. To further celebrate the spring feelings, I am upping my coffee game with this herby and floral latte. One of the best (and least expensive) purchases I have made for myself this year is a milk frother. While I have zero latte art skills yet, I do love making lattes at home and feel even fancier when I have my own simple syrup to add. It's the little things in life that make the daily things special, right!? I can guess what you are thinking right now. Rosemary in coffee?? YES, girlfriend! Rosemary and lavender in coffee. Sounds so weird and intense but it is actually so good! It is such a fun twist to coffee besides the normal flavors like vanilla, caramel, or hazelnut. Normally I sorta roll my eyes at fancy coffee drinks, and usually only take my coffee with milk or cream and sugar, or those hazelnut creamers that are probably pretty bad for you. The other day though I was getting some work done at Revolucion and ordered their honey lavender latte. It was so unexpectedly refreshing! I also read somewhere that rosemary pairs really well with lavender and is (oddly) very good with coffee. What I love about this simple syrup is that the woodsy taste normally from rosemary balances out the floral taste from the lavender, so you don't feel like you are drinking a bath bomb or a candle. 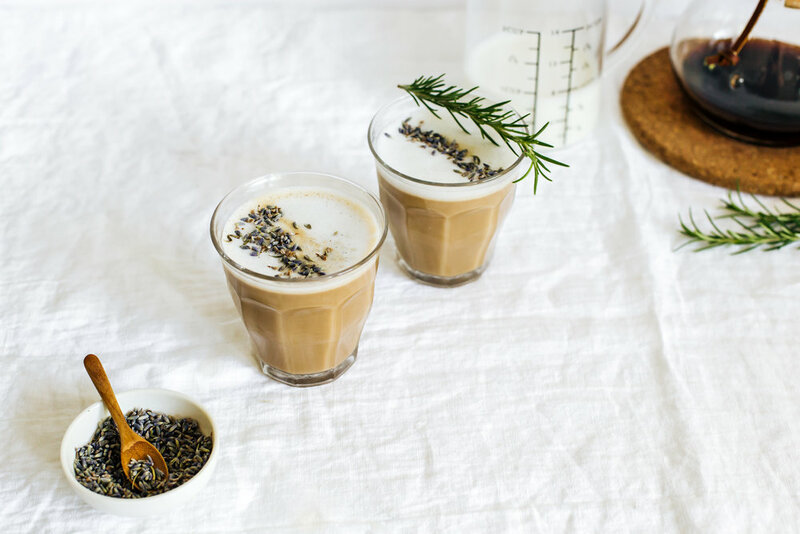 If you want to up your coffee game and feel oh so fancy, make this rosemary lavender simple syrup and stir it into your coffee. It would also be really good in a cocktail! In a small saucepan, combine the water, sugar, lavender and rosemary. Bring to a boil then reduce to a simmer, stirring occasionally until all the sugar is dissolved. Simmer for 10 minutes. Remove from heat and let syrup come to room temperature. Strain the lavender and rosemary from the syrup. Divide milk evenly between two mugs. Using a milk frother, blend the milk for 1 minute or until a thin layer of foam settles on top. Pour in the coffee evenly between both mugs. Sweeten with the rosemary lavender syrup (start with a little and add more to taste!). Serve immediately. How is your week going? I know I've been a little MIA on the blog and on instagram, but that's because things have been a little busy over here at our new house! I have had so many ideas for recipes and videos and fun blog posts but just have not had the time to crank them out. When I'm not working I'm helping Kyle with renovation things, and when I'm not doing house stuff, I'm walking Sibbie or playing with her. So far she is adjusting to the new house and neighborhood pretty well. I think she enjoys the space and the backyard, although most of the time she still hangs out near her crate and the large windows/sliding door in our living room. Such a rough life! An area I hope to get better at, and post more of on here, is cocktail recipes. I have never been interested in playing bartender at home because my knowledge of cocktails/wine/beer is embarrassingly limited. I don't drink that often and when I do I prefer dry red wines or fruity cocktails. I've never really understood what makes a good drink good but I want to change that, especially since we have the space now to have a better stocked bar area and can entertain more! One drink I definitely have a feel for though is margaritas, especially frozen margaritas. If you live in San Antonio (or surrounding Texas areas) there's a good chance most restaurants sell a version of it. This was something we immediately noticed while living in NYC—not many places sold frozen margaritas! The hibiscus syrup in this margarita is a game changer. It adds a floral and tangy note to the margarita but is not too overpowering. It also makes it this gorgeous purple/pink color! How would you describe it—magenta? Let's call it magenta. I made these for some friends recently and they were completely obsessed. Do yourself a favor and make these for home happy hour this week! This post was sponsored by Vitamix and the feedfeed! As always, all opinions are my own. Thank you for supporting brands that keep this site going!